Hello from my getting home after a long . . . I am not sure if it has been a long couple days, a long month, a long campaign, or seeming to be perhaps a long life. That is my perception of both the election, the campaign, and certainly what will be a terrific amount of prognostication from every corner of the country, if not the world. I actually walked into my bathroom about 7:45 last evening and noted specifically to look at the time when my thought was that Donald Trump was going to become the President-elect. I had said throughout the campaign, even in the primaries that he was not as stupid as people wanted to claim or believe. While I believed the actions of Mr. Trump to be embarrassing and shocking, perhaps I am not as typical in my thoughts as I might have imagined. While I thought his disparaging comments towards too many would have had a cummulatice consequence, that was not the case. That in an of itself speaks volumes about the present atmosphere in our country. I am dismayed, unsurprised by the atmosphere, which is even worse, and as we are two days into the transition watching things I have never witnessed following a presidential election. Certainly I have seen pain and sadness when one’s candidate loses, but I do not remember seeing or reading about such vitriol and protesting (and some that has become a sort of rioting) after the election of a candidate. Then again, I know we have never witnessed the sort of offensiveness or unseemliness in a campaign as we have just witnessed. My niece or great-niece, I cannot remember which noted that the media certainly has a role to play (and I might argue a significant one) in how the campaign unfolded. There are so many ways to consider this, but this is only one blog, so I cannot got into it all. (I am adding to this post on Saturday, now four days out.) I do believe there are more reasons than any one attempt to characterize the rationale for one side’s victory or the other’s defeat. While I am a life-long Democrat, I am fiscally conservative. While I believe in helping the other, I do not believe in free handouts. One of my more conservative friends have noted things about the protesting/rioting (and I do believe there is a difference). I do not have a problem with peaceful protest. I do have a problem with rioting or with destruction of another’s property merely because someone is angry. There are two things I would like to note, but then I will be quiet. I believe it is paramount that we come together as a country and listen – not merely hear the other as some kind of noise, but truly listen – to what our equally valuable citizens have to say. Again, I grew up in NW Iowa. I grew up in what is considered to be rural America and not every farmer or small town person or white person is red-neck, uneducated, and racist. On the other hand not every metropolitan black, Latino, or Muslim is anti-white or an illegal or terrorist. How did we get to the point that we seem to go there before we think or listen, and then think again? The second thing is this: when considering the candidates, I must admit in retrospect that there was a sort of coronation of Secretary Clinton as the only possible standard bearer of the Democratic party after she left the State Department. I feel some of this because of the Wikileaks and the hacking of the DNC or the DSCC as well as the response to Senator Sanders. Arguments made about how the campaign was managed have more credibility that some might want to think. Second, if we are to examine Mr. Trump’s rhetorical strategy in his addressing the issues of race, religion, economic inequality, immigration, gender, and you can probably add to the list, what is evident in light of the result is this, and while I say this with a significant amount of chagrin, and particularly in light of his comment in the last 24 hours (I won), one has to either call him a genius or despicable, or both. It was certainly a winning strategy in that he tapped into the anger of a great number of our fellow citizens. From where all that anger comes is certainly open to discussion and will be the fodder for a great number of pieces, scholarship, and a number of other responses. Second, it can be considered despicable because it appears to have created an even greater divide in our country (or, at the very least, exposed it for what it is). I am the soon to be elderly (and some already say older) white man, but I am educated. I do not consider myself to be an elitist, but that does not mean that others might not see me as such. We understand people for where they are when we meet them and we too seldom take the time to see the more complete or complex picture. The consequence for that lack painted a very different picture, but perhaps a more accurate one of who we are as Americans. The paintbrush of the American electorate is complex, but November 8th we created a picture of ourselves that has our entire civilization shaking their collective heads. Do we know who were are? Our popular vote painted on picture, but our electoral college created a different one. Regardless of where you stand, the final result says something both powerful and conflicted. How will we move forward. It begins with each person from both sides listening to the other. Perhaps that is what we might learn most importantly. It is not merely Hillary Clinton’s job to quell the protest, nor is it Donald Trump’s. It is ours as Americans. The protest is palpable. Rioting or damaging property out of anger is not the answer, and if you did not vote and you are out there rioting (again I see a difference), STOP IT! (I am back to what has been written previously) However, as I wrote yesterday, it was the 241st Anniversary of the Marine Corps and as I write today it is Veterans’ Day. Both of these things are important to me for a variety of reasons. My adoptive father served in WWII and after my birth father passed I found out that he had been in the Marines as I was. As I noted in my Facebook post, I was a scrawny 17th year old who left my home in Sioux City for my first plane ride to MCRD in San Diego in June of 1973. I think my last posting has my boot camp picture, which illustrates clearly I was still growing into my ears. Sad, but true. For some it was absurd that this squirrely 17 year old boy believed he could make it in the Marines. As some of you know, I did not make weight when I first went in and had to go eat a lot of bakery food and drink water to make the minimum guidelines for weight. I wish I still had that problem. Difficult to accept what age and metabolic change does. It was also the 533rd anniversary of the birth of Martin Luther yesterday. As I sit in my office this morning, I remember so clearly yet my trip to East Germany in 1985 and to many of the Luther places. I remember my trip to Buchenwald, which was where Bonhoeffer, the eventual subject of my dissertation, was incarcerated before his move to Flossenbürg where he was hanged. I remember listening to a lecture about Luther as the first Lutheran socialist. It was actually a pretty brilliant lecture, particularly in light of some of the more disturbing and racist things Luther wrote at the end of his life. Finally yesterday was the 41 anniversary of the sinking of the ore ship the Edmund Fitzgerald, during a November winter storm on Lake Superior. It is interesting to me how this one date has such a varied significance in my life. Today it is 98 years ago, almost a century that Armistice was signed in Versailles, a treaty that would actually led to the rise of Hitler, the Nazis, and eventually create the Holocaust. Again, it is absurd to believe that one person could lead such a cultured country toward the extermination of a particular ethnicity. but it happened. (I am back to writing on Saturday, November 12th.) I have been enamored with the German culture since I first got out of the service and my pastor’s family had come to NW Iowa from Germany. Their decision to continue speaking German on certain days of the week started a love affair with other languages and cultures that continues to this day. In some ways it led to my becoming a Lutheran pastor, to my dissertation and my continued study of this amazing country. The Germans also had a significant event in their 20th century history on November 8th (1923). It is worth considering. Yesterday I had the opportunity to speak with one of my dearest friends who I have known since I was barely in school. It was a blessing to speak with her and hear her thoughts. Partly because it allowed me to commiserate the week, but she was more liberal and open that I had actually realized. It also helped me understand that we make such assumptions about the other, even those we have known for decades. She noted she was probably the only person of her family who voted for the Democratic and she claims to be Independent, which I do not doubt. I am pretty sure that I am the only one in my family to vote for Secretary Clinton. None of them have said anything to me this week, but then again, I have not said anything to them either. I also realize this is contrary to the other things I have noted earlier in my posting. Part of that is I do not merely want to have a superficial and quick conversation They are too important to me. It was such a breath of Fresh Aire (pun intended for those understand it) to speak with her. I am increasingly cognizant of the magnitude those times in my life meant (and still mean to me) when we have had the opportunity to share time from sitting on a dock the summer of 1984 to dancing at Grandpas or The Jockey Club in the late 70s or early 80s, from chats on the phone to visits during the increasingly infrequent times I have been back to my hometown over the years. Amazing how one of the first recollections of my childhood has provided such a sense of comfort and care. In the conversation yesterday I was surprised to see how similar our philosophical bents are. This is actually a good example of the very disconnect that I address when considering the Presidential election of the past week. It is my narrow-minded elitism that I want to believe I do not have. While I have always known her to be thoughtful and considerate, I have not always given her credit for being as philosophical in her approach as she is. Part of that might be her faith background, part of that is because we have never really discussed things as we did this week. What I have always known about her is her pure and caring spirit, her unequalled love for her son and her family, and her amazing beauty and grace. What a joy to learn more about my life-long friend and sort of soul-mate. If I return to things I still need to get done, it seems there are more things being added than subtracted, and I am not sure that will change anytime soon. It is where we are in the semester: between a strike, an unparalleled election process, and four preps, the semester is kicking me. I must also admit a good part of it is I am getting older. It is also in that I have been struggling a bit again with my health. This is the consequence of a couple of things. Managing my health, which is always an issue, and then finding that I am allergic to cats, which I did not know. It is amazing how that exposure affects my breathing, swallowing, my eyesight and a tightness in my chest that is different than anything I have ever felt. It has been a difficult time because I am committed to helping my friend, but trying to figure out the logistics is becoming more perplexing, more indecipherable. Certainly some things have been accomplished, but progress seems to be slow; yet, I am more aware of why that is than some might think. There are so many demons that one must confront and about which one must be honest . . . and while we would like to believe that honesty is something we should just reasonably do, perhaps nothing is farther from the truth. It is so difficult, taking more of a herculean effort that one might expect. It is because honesty requires accountability, something that scares us. While there is much more I could write, I want to get this out and then move to the next thing on the list. It has been an interesting week, and it seems that will not change soon, either in Bloomsburg or in the wider state, country or world. As I finish this post, a couple more days have passed and today would be my sister’s 60th birthday if she were alive, so this is a shout out to her. She did have an incredibly giving heart and she was an even more tremendously intelligent person. Happy 60th Kris. I wish you were still here and we had talked more. She was an enormous fan of Anne Murray, so I offer this video for her in remembrance of her birthday. Thanks to everyone else for reading. I have been busy doing work and trying to manage a number of issues. I have tried to complete a blog on two or three occasions, but the last month has overwhelmed me in ways I could have never imagined. There are a number of things that have required my attention outside the normal classes, prep, grading, and daily life, but it seems that I have felt more paralyzed by all of it than I ever have. It is hard to believe we have been through an actual strike of faculty within the system; it is hard to believe we as a country have endured a political campaign for president that seems to have created and exposed more hate and discontent than one might have imagined in their wildest dreams (at this point, besides feeling exhausted by it all, I am mostly embarrassed). I actually feel badly for those who are voting for the first time. While I am hoping they believe their vote matters and democracy matters, I cannot blame them if they are feeling a bit disenchanted or disillusioned by what we have witnessed. As those who know me can be sure of, I have a particular viewpoint on the election and what I hope happens. Yet regardless of what we wake up to on Wednesday morning, if anyone believes the election will eliminate the unparalleled rancor that has characterized this election (be it the primary on one side in particular or the general election), they are sadly naïve. Perhaps what this election has revealed is the deep divisions in this country between those who are educated and those who have not gone beyond a 12th grade education (or less). Let me say immediately, I know this does not characterize every single person, on either side. I have college classmates who are adamant supporters of Mr. Trump, and I still respect and consider them to be intelligent and good people. I also know some persons who did not go to college, but support Secretary Clinton and are also not welfare recipients or on the dole. What I am saying is there are things that do not add up for me at times, but I will always try to respect the decision of another, particularly if they have thought through their position and can articulate why they believe as they do. While I like politics and the give and take of what is happening in a campaign, what I realize is the last 20+ years of American politics has become an exercise in character assassination and working on most every level to attempt to thwart those with whom one disagrees. Any thought of working across the aisle is something of the past. Any attempt to see what is for the greater good of the country versus working to merely get re-elected is long gone. I believe the practice that one can disagree with another, but remain civil is also a thing of the past. How did we get here. As I sat here today I listened (mostly because I had no choice) to a table of Bloomsburg sorority students as they were eating a late breakfast. They had language that would shame a group of Marine Corps DIs, and they were not shy about using it. Not very impressed, and there was not thought of what others might think of their vocabulary (or lack thereof). While this might seem of little importance as we move toward electing a President in a campaign that is certainly not like any other in my 60+ years, but I think there is a bigger connection here than one might initially imagine. What does it say when the use of vulgar language is commonplace? What does it say when there is little consideration for how what we might say might affect those who hear it? What does it say when freedom of speech, freedom of the press, or any of our Bill of Rights has become a license to do whatever, whenever, wherever we want? John Locke on his Second Treatise on Civil Government asserted that “[b]y entering into civil society, the individual submits him or herself to the majority, and agrees to abide by the rules and decisions of the majority.” And then goes on to note “[s}ince people are all born under some government, they are not in fact free and at liberty to unite together to change that government.” Furthermore, “[b]y entering into society, people relinquish their freedom under natural law, and their right to execute law. Instead, in this society, they establish a judicial power to arbitrate disputes between members of the society, a set of laws that all the members of the society must obey, and an executive power to maintain and enforce the law” (Locke). I should by extension note that he also says when a civil government has not done its duty, it is the duty of the people to stand against it. While many of us on either side of the political aisle can make our claims, it is interesting how so many “lawyers” who walk the hall of our United States Congress seem to be focused on only what they believe serves their own interests (i.e. getting re-elected and thereby receiving their pensions). Again, as I looked today, it seems Congress has an underwhelmingly dismal approval rate of 12%. The point I am trying to make is when our language, our actions, or our sense of decorum seems to exhibit so much individualism that perpetuates disdain for the other we have a problem. I have often spoke about “the other” in previous blogs. This election has often been about the other, be it the other candidate, the other view, the other person, the other religion, the other ethnicity, the other gender. What is so disheartening is the other has been, almost without exception, regarded as negative. We are a nation of others and have been from the beginning. We were the others that left Britain because we felt we were oppressed. Many others came here hoping that they might be accepted for what their otherness had to offer, but throughout our history we have struggled, but learned to assimilate and accept. We were willing to incorporate, but many time with some kicking and screaming. Again, what I am noting is that change is always frightening. It is painful. What are the changes you see in our present situation? What are the positives and the negatives? Are we as divided and in such dire straits as some would like us to believe. My good friend and brother, Jose, with whom I do need to catch up when I can come up for air (this is my coming up for air for the moment), notes that too many of the 1% want the 99% to fail to think or question and he is correct. I do believe that some of the good in this election, if I can look impartially for a moment, is that there is a lot of questioning. That questioning can be positive, but when people are willing to accept sound bytes for answers, the questions have not really been answering, they have only be placated. There is so much more critical thinking that must occur. While I am willing to subscribe to some of the idea of “throw the rascals out,” I am not willing to jeopardize our democratic process. Questioning and even pushing those questions to make them critical is necessary, fear mongering and claiming things that are simply not true, blaming the other for all of our current difficulties is tantamount to returning to the a post 1933 Germany. I know that is a serious statement and one that might raise both eyebrows and ire, but as I stand as a Marine Corps veteran, I do not make such statements haphazardly. For too long we have blindly accepted what the Congress deems appropriate. It matters not (and I only mean this in this specific situation) who we elect for our executive leader beyond a certain point. When the Congress is willing to make statements like “We will make Obama a one-term President” (McConnell). Or there is already talk of further obstructionism should Sec. Clinton get elected, we need to rethink our legislature. I am a proponent of term limits for anyone in the Congress and I do not think they should get the pension they do. Let them be in SS like the rest of us and let them put part of their salaries into their retirement like the rest of us. I would also be a proponent of a one term Presidency – 6 years and done. I also understand that that might argue that every president is a lame duck when they enter office, but six years is a long time. I am also a proponent of a flat tax. Everyone pays a particular amount or percentage and no one (even if they can claim an almost billion dollar loss) is exempt. There . . . have I fixed all our problems. No . . . probably not. What I wish is that we might merely be more civil . . . that we might realize that we have a duty to the other. We have a duty as humans to care about our fellow human beings, and I already know what some will argue or question? What does that mean. For me it means that all who are able need to contribute in a meaningful and significant manner. It means that we do need to help those who are less fortunate, but it does not mean merely taking from the rich and giving to the poor in some sort of Robin-Hoodian manner. It does not mean that we stop encouraging an entrepreneurial spirit or invention, but it means that we attempt to conduct ourselves in a manner that sees all people as valuable. I know that is difficult at time. I am reminded of a former colleague who has struggled mightily and consistently made choices that have impacted both the individual and those in even more than arm’s length from them (and I realize some of the syntax issue). This past week, I found out that one of my most important mentors passed away from cancer. Her name is Carol Berkenkotter. She is perhaps as single-handedly responsible for my getting a Ph.D. as anyone. She was the person I met by waiting on her one evening at The Library in Houghton, MI. She unknowingly asked what else I did and that led to an entire conversation that ended up with me visiting her office and getting accepted into the RTC program at Michigan Technological University. Her brilliance, her inquisitive nature, and her willingness to mentor and challenge her students taught me in ways that still influence me. As we move toward in the next 30 hours or so, determining where our country will go for the next term and beyond, I can only hope that we might find our national spirit that will move us beyond what has been nothing short of embarrassing as an election process. Can we accept the will of the majority or the electoral college? Remember in 2000 Al Gore actually won the popular vote and lost the election (and I do not want to get into the entire Supreme Court issue). Bottom line is he lost. What I hope is those who care to vote are able to do so and do so legitimately and without rancor or intimidation from anyone. What I hope is on Wednesday we begin to work toward some sense of coming together as a nation. What I hope is that we know that all people matter and as a country we still have a coveted and valuable society. What I can still say simply is, in spite of all, I still have hope. 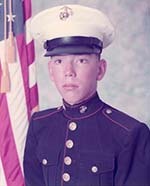 Even as a young 18 year old Marine, who looked more like he was 12, I had a sense of hope, though I was scared to death. With that, I offer this video that says I hope we can watch and listen and appreciate the other. Thank as always for reading and I wish you a thoughtful and personally rewarding election day.